Bred for landscapes, Surfinia Sumo is perfect for large containers, hanging baskets, and beds. 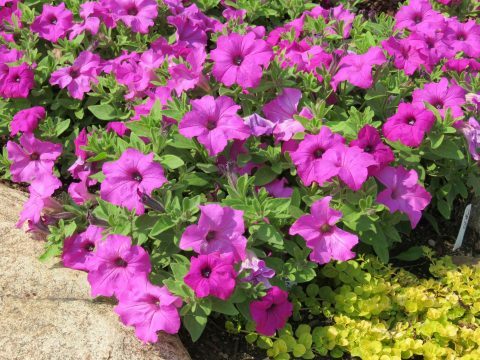 Gorgeous mounds of large flowers bursting with colors including pink, glacial pink, plum and bold lilac. 6-inch pot (2 pinches), 10-inch baskets (2-3 pinches) Less pinching is needed when grown cool. Spray 2500-5000 ppm B-9, or drench 1-3 ppm Bonzi. Apply as needed. Botrytis on foliage, soil pathogens. Use a broad-spectrum fungicide after planting.